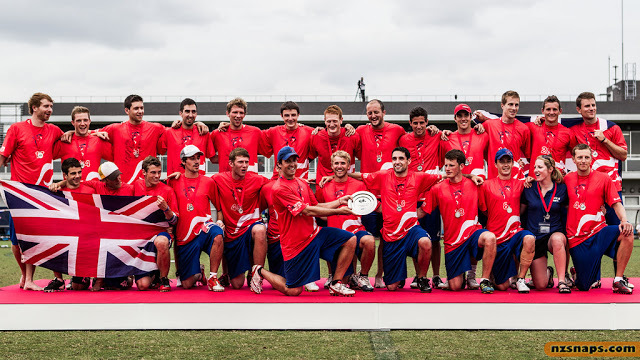 GB Open and World Games coach Sion “Brummie” Scone tells us what he and the Open squad learnt at the World Ultimate and Guts Championships last summer. Brummie: This is an article that I originally wrote for Ultimatum (the UK Ultimate annual magazine) in the days immediately after my return from Japan last summer; however, I managed to forget to click “send” on the email, so it has been sitting in my drafts the whole time. Oops. As expected, Worlds showed a wide variety of new offensive and defensive strategies. Here is a collection of thoughts centred around GB Open’s performance, but also looking at all the games I saw in all divisions – particularly the impressive Japanese women’s team – and a group of lessons that we can take home as things to work on over the next four years. Our throwing ability is short of the top teams; particularly USA and Japan who had strong throwers across their entire team. They also were comfortable with a wide variety of throws; bladey throws and inside-outs over short distances being two main ones that other nations use well for handler resets and zone breaking. The Japanese women were probably the best throwers across their entire team, and they won handily. Lesson: Throwing skills are massively overlooked in the UK in favour of athletic ability. We need to continue to challenge our throwers to improve; why not use games and drills which force your players to use new throws? Don’t worry about turns – there will be plenty! – but the long term improvements will be huge. GB Open used a modified version of Lou Burruss’ Kung Fu Throwing routine for a year before WUGC, and I highly recommend using it (or the Wiggins alternative) as a starting point. Throw, Throw, Throw! Wessex vs ManUp, 2012 season. Courtesy of Kat Smith. We need to have better resets; Japan Open in particular had very strong resets that led to continuation and constantly kept us on the back foot, while the USA were confident at recycling the disc under pressure. Both teams were great at turning a reset into an attacking position. Lesson: Our resets need to be more than just “get the stall back to zero”, and should instead come with brutally effective continuation. Consider continuation as being part of your reset; failure to hit continuation is failure to reset properly. Most European teams play with static marks that are too close and foul often. Good throwers will abuse these with ‘contact’ calls or calling ‘foul’ during the throw. Lesson: be mobile and legal on the mark for the most effective defence; sometimes being in the cutting lane, outside 3m of the thrower, is the most effective thing you can do to prevent flow, and is certainly better than fouling. Your team needs to be adaptable if they are going to be effective. Man-zone hybrid defence is going to become more and more prevalent in the future; when teams know precisely when and where they should be poaching and how to switch effectively, these defences are tough to beat (Sweden, Japan women). It is important to note that these zones were mostly effective because of good work ethic away from the disc; early repositioning and timely switching helping to stifle flow, rather than apply pressure on the disc, then quickly repositioning as the disc is swung. 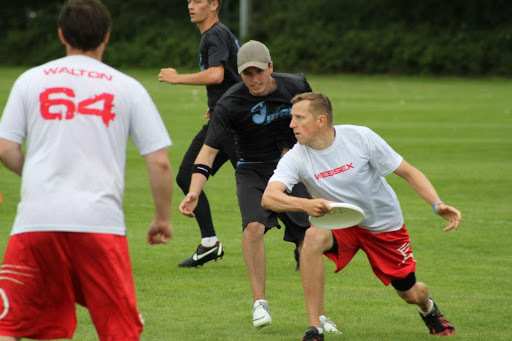 GB Open’s zone offence generally failed to keep the disc moving against zones (Sweden / Japan), even once the cup had been bypassed, and this comes back to the issues with handler resets (as mentioned above). Only by swinging the disc with fast throws, and constantly taking small gains with handlers, is it possible to take these zones apart (see USA / Canada / Japan Open teams). Short range overheads, and short leading throws, are also areas we need to improve on. Lesson: learn to throw the disc hard and play fast if you want to beat any non-man defence; continuation is just as important with zone O as with resets. All teams also need to be able to effectively switch and poach if we want our clubs to understand and be able to combat these types of defence. I would encourage all teams to think about creating a new defence, and *stick with it*; they take time to work, maybe two years or more. As a defender, know what you’re taking away, i.e. “Know where your kitchen is”, and what you can allow. (GB Open called the area just in front of the disc on the open side “the kitchen” and being beaten into this space was a big no-no.) Most defenders are purely reactive, seen chasing their man around the field, rather than proactively adopting a body position that will prevent the bad guy getting into your kitchen and flirting with your mum! So, regardless of where you are and where the person you’re guarding is, make sure you know your relative position with respect to your “kitchen”, and never allow them to slip through and steal your dinner. Lesson: To play great defence requires great focus, and that focus only comes through training under pressure, but, more importantly, every member of the team needs to be a great athlete. You have to be in great shape to be a contender; this is no great surprise. We should be proud that “British defence” is strong enough to get the disc off any team in the world. We need to focus on improving our D team’s ability to score more consistently under pressure to take advantage of these hard-won turns, particularly against teams like Sweden, Canada and Colombia that try to change the pace of the game to take you out of your comfort zone. The faster you play, the harder you are to stop. Being able to work at high speeds, and in tight spaces, are the key factors that will be vital in years to come. “Old skool” offences which isolate a single player in a large proportion of the pitch were not hugely effective at Worlds. Likewise, failing to swing the disc quickly (fast throws) plays into the hands of poach sets. Lesson: offences need to be adaptable enough to take advantage of momentary advantages which will be presented by poach sets, but everyone needs to be on the same page to prevent costly mis-communication turns. Learn to throw fast passes to stationary players to minimise hang time and reduce the effectiveness of poaching. In short, offences need to be comfortable playing in the small space in front of them, rather than needing large areas of clear space to advance the disc. GB Open broke the mark more consistently than all the teams we played other than USA, and we had success because of it. Japan’s approach was more along the lines of “avoid the mark, but get it to the undefended side anyway”, which was brutally effective and tough to stop. Lesson: be confident breaking marks, but you don’t necessarily need to break the mark in order to get the disc where you want it, which is generally in the hands of a receiver cutting towards the break side of the field. As long as their defender has no bid on the disc, it is a great option. If you don’t need to risk breaking the mark to achieve that, that’s perfect. One way to achieve this is to isolate a cutter on the open side and have them cut to the break side; the resulting pattern will be an open side throw for the thrower, but will still be away from the receiver’s defender. Win-win. 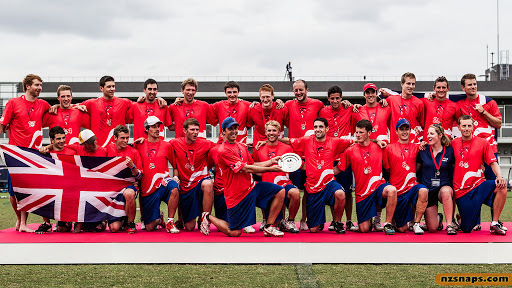 GB Open take Silver at WUGC 2012 in Japan. Courtesy of nzsnaps.com. Liked what you read here? We hope to hear more from Brummie in the future. Do support him and the World Games team in any way possible. Don’t forget to share, like and tweet this piece and our blog too!